Dashboards, reports, KPIs, and metrics are all part of life in the contact center. The challenge: putting all that data in context to use it effectively. Does your team struggle to measure or improve the customer experience consistently? If so, you’re not alone. According to a 2017 ICMI survey, it’s one of the top ten challenges for contact center leaders. Join us on February 22 as we help you identify ways to understand the most complex customer feedback in an organized and comprehensive manner. We’ll also show you how to use the power of text analytics to put your metrics in the right context, and how to deliver those valuable insights to key decision makers across your company. Join us for an interactive and informative hour, complete with live audience Q&A. Is agent morale a top challenge for your team? Pizza parties, contests, and ping pong tables are fun, but they’re not enough to move the needle. Even leaders with the best intentions tend to struggle to get agents to bring their best selves to work each day. The result? Disengaged agents, poor service, and frustrated customers. It doesn’t have to be that way! Join us on May 22 to find out how you can practically refine your people, process, and technology strategies to overcome some of the common obstacles to high morale and engaged employees. - The counterintuitive reason why motivation is a top challenge for contact center agents. Join us for an interactive and informative hour, filled with practical tips, and complete with live audience Q&A. According to new ICMI research, only 16% of contact center leaders strongly agreed that their QA program was setting them up for success. Are you part of the 84% that aren’t completely sold on your QA program? If so, mark your calendar! Join us on April 24 to get an exclusive first look at the soon-to-be-released results from our recent quality management and analytics study. Whether you’re looking to benchmark your current practices against your peers, or seeking ways to refine your approach to analytics and quality management, you don’t want to miss this! According to 2018 ICMI Research, customer experience strategy is a top priority for contact center leaders this year. The challenge? Determining which KPIs to use to track success, and interpreting all the data already available to drive meaningful results. Join us on March 20 as we walk you through the ins and outs and CX metrics, and help you discover new ways to understand even the most complex customer feedback. We’ll also show you how the contact center can deliver actionable insights that will fuel success across the rest of the business. The word omnichannel has dominated both contact center and marketing conversations for many years now. But according to ICMI research, less than one-third of contact centers in this community consider themselves truly omnichannel. Making the most of existing contact channels, customer data, and analytics can feel daunting. Taking it all to the next level? Even more so. If you know your contact center needs to evolve, but you're not sure how to take the next step, this is the webinar for you! No matter where you currently are on the path to omnichannel, we'll break down the complexity, dispel common myths, and help you prepare for the future. When asked to share their most daunting challenges, contact center leaders in the ICMI community listed hiring, scheduling, and long-term planning at the top of the list. Can you relate? Join this webinar to learn how you can improve the building blocks of WFM, scheduling and long and short-term forecasting, using machine learning and cloud computing. These new processes improve accuracy and dramatically improve solve times, hinting at a new class of contact center WFM analytics, which will improve WFM efficiency and agent engagement. If you're ready to transform your planning and scheduling process, you don't want to miss this complimentary webinar in partnership with Genesys and The Society for Workforce Planning Professionals (SWPP). Join us for an interactive and informative hour, complete with practical tips and a live audience Q&A. Most contact centers operate with the goal of delivering exceptional customer experiences, but how many achieve that objective? Executing on big vision customer experience initiatives is daunting, and if no one "owns" the strategy, it's nearly impossible to attain the desired results. How will your team achieve success in the year ahead? Join us for this can't-miss webinar that will help your organization drive meaningful CX improvements in 2019. Have you ever had an annoying customer experience? Are you annoying your customers? During a recent #ICMIchat, we asked participants to share their biggest customer service pet peeves. Some of the answers might surprise you. Join us for this fast-paced, fun, and practical webinar. We’ll reveal a list of the top ten ways call centers exasperate their customers, and also offer up tips for breaking the bad habits. Join us for an interactive and informative hour, complete with live audience Q&A. Come ready to take notes and ask questions! Fast forward to end-of-year reviews in 2019. What will your team have accomplished? Will you be proud to report on soaring CSAT scores, transformative process improvements, and unprecedented profits? If you want to set your team up for success in the year ahead, now’s the time to start planning. Join us for this eye-opening discussion on the trends you need to watch as you prepare your contact center for the future. In an increasingly crowded marketplace, customer service has emerged as one of the last frontiers for competitive advantage. But in a rush to be everything to everyone, many companies are overlooking one enduring need of its customers: the desire for human connection. JetBlue was founded on the mission to "bring humanity back to air travel." During this webinar, you'll hear how customer service has set the airline apart in the past, present, and vision for the future. You’ll also learn how companies in any industry can apply lessons JetBlue has learned to deliver more practical, personalized, and delightful service experiences. Consistency is a common challenge for contact centers and organizations of all shapes and sizes. How do you get employees from different teams, backgrounds, and locations to deliver the same experience? Adam Toporek, author of Be Your Customer's Hero: Real-World Tips & Techniques for the Service Front Lines, has practical advice to share that will help you elevate the customer experience. Invite your team members to join us for this special edition webinar. It's the perfect way to kick off Customer Service Week! With all of the change that’s happened in contact centers over the past 10 years, it may be daunting to think about the years ahead, but it’s a necessary and revealing exercise. Strategic, long-term planning enables organizations to prepare for and anticipate investments in technology, shifts in their workforce, and evolutions in their methods for delivering service. But how far out should a long-term plan go? And what should or shouldn’t be included in the process? In this ICMI webinar, you’ll hear from contact center expert Justin Robbins on how long-term planning has changed in recent years, what’s the most effective data for future planning, and ways to leverage the changes in technology and customer expectations to your advantage. Want to show appreciation to your contact center agents, boost morale, and draw attention to the integral role the contact center plays in your organization? Customer Service Week (October 1-5) is the perfect opportunity! And while it may seem far away, October is just around the corner. Need help planning? Whether this will be your first year celebrating Customer Service Week, or your 20th, you don't want to miss this webinar! Join us to hear from three ICMI Global Contact Center Award winners. They'll share their favorite tips for making the most of Customer Service Week, as they arm you with inspiration to plan a memorable celebration for your team. Whether your organization wants to improve customer satisfaction, boost productivity, or increase revenue, the customer journey is at the heart of it all. And with today’s customer expectations on the rise, getting customers to the right agent, at the right time is critical. The problem? Most businesses think they’re doing a better job of meeting customer expectations than they really are. In fact, Genesys research indicates that only 19% of businesses have a dedicated customer experience team to manage the experience. Ready to differentiate yourself from the competition? Find out how predictive routing is becoming a fundamental part of delivering the genuinely omnichannel experience that customers now expect. Are your agents empowered to deliver outstanding service, or are they forced to navigate disjointed tools, and bound by policies or KPIs that ultimately result in frustrated customers? Agent empowerment is a critical component of the effortless customer experience, yet according to ICMI research, 74% of contact centers admit they prevent their agents from providing the best service possible. How can we change this? Join us on June 20th for an eye-opening discussion that will arm you with practical advice you can use to make positive changes in your contact center. According to ICMI research, 62% of contact centers believe their organization considers them a cost center. Contact centers have long been misunderstood, plagued by stereotypes, stigmas, and misconceptions. But contact centers of the future are uniquely positioned to fuel growth across the business through product enhancement, customer retention, and employee retention. The strategic contact center of the future won't just focus on people, process, and technology improvements, but products, too. Join us for this webinar to find out how your contact center can use all the customer data at your fingertips to empower smarter business decisions and boost the bottom line. While recent research shows that only 41% of customers prefer to contact companies via traditional “voice” channels, contact centers are still managing most customer interactions over the phone. Perhaps that's why 39% of customers would rather clean a toilet than reach out to a contact center? The good news: technology is making it easier than ever to understand customers and serve them more efficiently and effectively in their channel of choice. AI and Machine Learning are no longer futuristic concepts; when leveraged correctly, you can ensure more timely, relevant, and personalized service. The future is now. Are you ready? What is the strategic difference between customer service and customer experience? How can contact centers improve ROI by improving the customer experience? Join us as Nate Brown breaks it all down, and arms you with strategic direction to drive growth in the year ahead. You'll learn how to gain the buy-in you need to move your CX initiatives forward, how to find opportunities for quick wins, and how to leverage customer feedback to generate revenue. Bonus: attendees will gain free access to Nate's newly released CX Primer tool. Workforce management is one of the core pillars to a successful contact center operation. But, for as much planning that’s done in advance, the intraday management of the frontline staff is where WFM really hits the pavement. For many organizations, however, intraday works is highly manual and consumes valuable time and resources. As a result, it’s not uncommon for contact centers to lose significant productivity, and ultimately profitability, because of the manual work that’s happening. 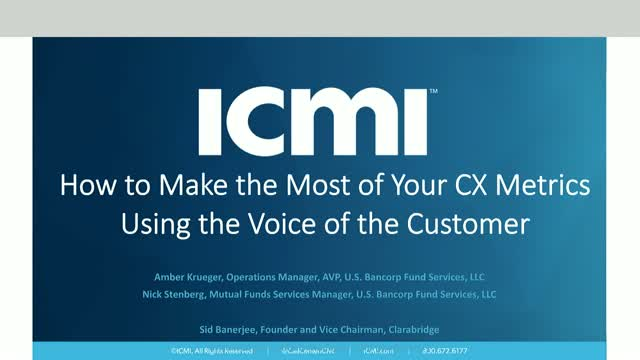 In this ICMI webinar, you’ll hear the latest research from ICMI and NICE on how much damage manual intraday work is doing to the contact center and, more importantly, what can be done to reverse the trends. Gain valuable insight on how to get better results from your intraday processes, while positively contributing to employee engagement and buy-in. If you’re looking to maximize your resources to their fullest, this is one presentation that you don’t want to miss. Hiring, training, and retaining the agents we need to succeed is a classic contact center challenge. Many contact center leaders intuitively understand that hiring for culture fit is the first step in the process. The tough part is defining exactly what culture fit means and then scaling the concept so different hiring managers are making consistent hiring decisions. In this webinar, customer service expert Jeff Toister will share a practical guide for hiring agents who fit with your contact center culture. He will also reveal how to better integrate training and recruitment so you can retain your best agents. Whether its your people, your processes or your strategy, ICMI wants to partner with you to take your customer service to the next level. Our webinars, delivered by an experienced and dedicated team of industry insiders and thought leaders, are designed to help you raise the strategic value of your contact center, optimize your operations, and improve your customer service.